The Dolly Spartans are so much more than a kitschy name. The band is reminiscent of a minor league Strokes, with a pop sensibility encrusted in a rock candy shell. The Minor league thing isn’t a negative connotation, they just need a longer incubation before they achieve pop greatness. The band’s 2nd EP Time Sides With No one is a great start. The record is an onslaught of pop hooks, solid vocals, and whimsical guitars filtered through a glossy sheen. Lead track “When the Wheels Stop Moving” is a solid, danceable chorus fit for the radio. “Hanging Out” is a bit more punky with a firm nod to Franz Ferdinand and Vampire Weekend. “It’s Not Easy” follows the same pattern with a Radiohead “Street Spirit” type intro. Title track “Time Sides With No One” is the gem of the 5 song EP that brings a dose of easy energy running down the highway. 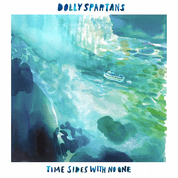 The Dolly Spartans are a really good band, just about a decade too late. They would have been huge in 2005, but that shouldn’t matter. Their mixture of plucky singalongs, punky dish towels, and splintered reverb should be enough to drive them to the edge where fans can enjoy the ride.